As the stakes rise in Catalonia, what does their crisis teach us about the complexities of the struggle for self-determination - and about the British state? 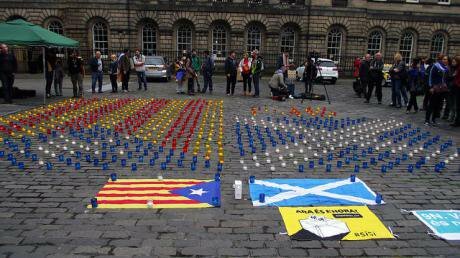 Image: Catalonian nationalists in Edinburgh on the day of the Scottish referendum. Photo: Byronv2/Flickr, Creative Commons. There are many reasons to be thankful for living in Scotland. This was brought home powerfully in a week which has seen the Catalan referendum, the experience of the Iraqi Kurds voting on independence, and even the tragic events in the US when Las Vegas witnessed yet another mass killing and carnage. Scotland is a prosperous and peaceful country. Unlike Catalonia we could have an independence referendum which everyone agreed to, participated in, and accepted who won and who lost. Central to this was the role of the British Government. For all the pro-independence ‘othering’ of Britain and the British state – for all its pursuit of inequality, its war on the poor and the welfare state, and its many military adventures abroad, it acted (in the Scottish example) with an element of insight, intelligence and even wisdom. And we were all the better for it. The British state has numerous problems and inadequacies, but also has an adaptability and flexibility. This can cause problems: the reach of the elective dictatorship, the lack of checks and balances, and the unwritten nature of the British constitution. But it also provides advantages. It allowed it to agree, with the minimum fuss, to holding the Scottish independence vote. It allowed the setting up of a Scottish Parliament and Welsh Assembly with speed and ease post-1997, as well as brokering the Northern Irish peace process. Compare this to the experience of Catalonia. The Spanish Government did all it could to stop people voting. They seized ballot papers, arrested officials, disconnected technology and shut down apps, and when that failed used police brutality and repression - the latter in full display of a shocked world who could not believe what they were seeing in 21st century Western Europe. In one day - October 1st 2017 - the Spanish Government lost any right to the high ground and made the Catalan case for independence even more powerful. The contrast between Spain and the UK could not be more stark. The Spanish Prime Minister Mariano Rajoy claimed Spain’s actions demonstrated ‘firmness and serenity’. Almost Trump-like, he denied that a referendum had actually taken place. He hid behind a defence of the 1978 Spanish constitution and “the indissoluble unity” of the Spanish nation and people. He claimed – as only a few uber-unionists had done in the UK - that any vote on independence for any part of Spain had to involve agreement and a pan-Spanish vote. In Scotland, for all the rows about the rights and wrongs of a second independence referendum, the terrain we stand in and any future constitutional paths are much clearer than in Spain. Any indyref2 will only happen here with the express permission of the Scottish and UK Governments. There will be no UDI and no unofficial referendum. Spain is in a very different place. The idea and ideals of Spain have been dealt a powerful, perhaps even mortal blow. It’s hard to see how the Spanish and Catalan authorities can agree any way forward. The stakes are high – this is a crisis about democracy, self-determination and the right of a people to be only governed by consent. The Catalan authorities will clearly not back down, but what mechanisms for independence can be identified which Spain will respect? How can the Spanish government climb down from using repressive force? And if Spain in the short-term further ratchets up the temperature by suspending the Catalan authorities (via Article 155 of the Spanish constitution) what kind of end game have they in mind? The Spanish-Catalan experience has raised difficult questions about the attitude of the EU and other European governments. Many issued bland statements saying that it was a matter for the Spanish authorities and Spanish people. Not one condemned the state violence that was recorded by the world’s media. It was all a bit redolent of the embarrassing silences of the West before the collapse of the Soviet Union as the Baltic republics of Estonia, Latvia and Lithuania tried to negotiate their independence. The Catalan vote and the recent Kurdish referendum throw up the thorny issue of who and what constitute a nation state? The realpolitik answer is that the shape and nature of the world and even the boundaries of most nation states is entirely haphazard and one which in many cases defies logic and any sense of natural justice. Instead, the existence of many nationless peoples, from the Kurds to Palestinians and the case of Tibet, are a product of when and how empires retreated and dissolved, and who emerged at the right time to seize the claim of statehood. The writer Fred Halliday called this ‘post-colonial sequestration’ to explain this state of affairs, by which some nations emerged as empires fell, and others (the Kurds, Palestinians, Tibet) missed the opportunity and then have had to struggle to claim their statehood. Scotland and Catalonia are different, as are the reactions of the UK and Spanish governments. It defies complexities, past histories and current realities to see one simply in the colours of the other. Pro-independence supporters in Scotland declare: ‘We are all Catalans now’. But equally problematic is the blind allegiance to big state nationalism, one letter writer in Tuesday’s ‘Guardian’ laying into ‘Catalan, Scottish and other micro-nationalisms’ led by ‘demagogic politicians’ trying to break-up ‘successful countries for personal glory and self-advancement’. Self-determination in one territory doesn’t simply translate into self-determination in another country. Indeed, it can even be seen as undermining its very principles by raising it into an over-arching truism, ignoring settings and histories. Thus, it doesn’t make sense to trundle out a new European Domino Theory as the ‘Times’ did on Monday, producing a map of the ‘main European separatist movements’ in a sort of at ‘risk’ register with Scotland and the Flanders at the top. Come back to our Scottish experience. We are privileged to live in a place which for all its many faults can agree to common rules on one of the biggest questions it is possible to ask: do you wish to be independent? Margaret Thatcher conceded that the Scots had the right to decide their own fate. Malcolm Rifkind, Tory Secretary of State in the 1980s, said half-joking that whatever happened he would guarantee that he would never send in tanks to put the Scottish people down. That is a world apart from the repression of the Spanish authorities with the shadow of the Franco dictatorship hanging over events. Even the Spanish monarchy – which has traditionally post-Franco been seen as the upholder of democracy - has entered into the fray. King Felipe said in a rare TV address that the Catalan authorities were engaged in ‘an unacceptable attempt’ to take over Catalonia with the aim of breaking ‘the unity of Spain’, and by doing so had put themselves outside the rule of law. Contrast that with the nuanced and coded words of Queen Elizabeth II outside Crathie Kirk the Sunday before Scotland’s referendum where she commented that people should ‘think very carefully about the future’ before they voted. All of this also reflects on the nature of the United Kingdom. The caricatured, reactionary image of the UK is one many of us tell and retell on many occasions. This is a country which has presided over war and military action in every year since 1945, which sponsors privatisation and corporate greed the world over, and has long lineages of racism and xenophobia. But there is also another British story: which includes the defeat of foreign and domestic fascism, and the victories and triumphs of generations of working people and the labour movement which have stood for democracy and human rights and against the powers of privilege and reaction. The good British story has rightly taken a bit of a battering these last few decades. But the events in Catalonia, just like the events in Iraqi Kurdistan, and Las Vegas, remind us that not every aspect of British life should make us gloomy. There are reasons to be cheerful in Scotland and even a few reasons to be cheerful living in the UK. And they remind us that the world is a messy, complex place which cannot be understood by recourse to one interpretation or set of principles.